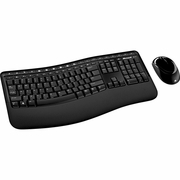 Dress up your desktop with this beautifully modern keyboard and mouse set. With a tasteful mix of glossy and textured black surfaces, this desktop set will have you appreciating its good looks every day. The ergonomist-approved curved keyboard encourages you to use a more natural posture that aligns your arms, wrists, and hands for greater comfort. With a reliable wireless connection, you can eliminate clutter and work from anywhere in the room—up to 30 feet away. Customize Taskbar Favorites on the keyboard and the buttons on the mouse for quick access to the programs, files, media, and webpages that you use most often. Plus, enjoy Advanced Encryption Standard (AES*) technology, which is designed to help protect your information by encrypting your keystrokes. Give yourself the freedom to move around with a wireless keyboard that lets you work without worrying about tangled wires. The Comfort Curve design from Microsoft encourages natural wrist posture and is easy to use. Advanced Encryption Standard (AES) 128-Bit Encryption. Give yourself room to move with a wireless keyboard that lets you work without worrying about tangled wires. Take advantage of BlueTrack Technology, which combines the power of optical with the precision of laser for remarkable tracking on virtually any surface. Full Compatibility on All versions of Windows 7 and greater.